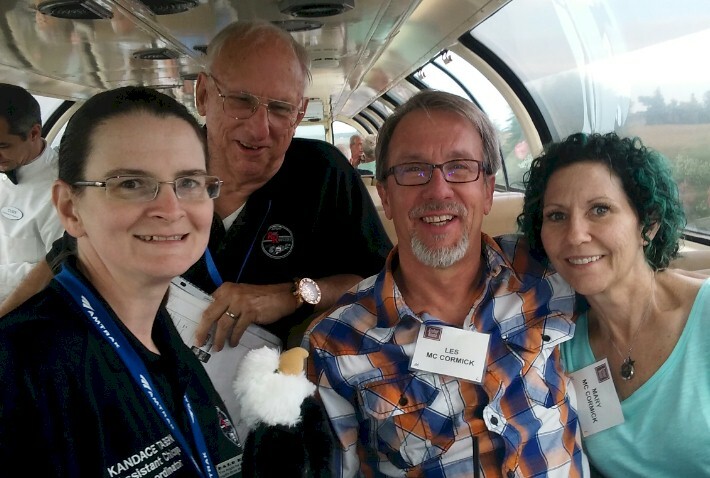 Ever since the APRHF Rail Rangers program was founded on July 20, 2015, one of our major goals was to bring a group of passengers to La Plata, Missouri by private railcar. While the headquarters of the American Passenger Rail Heritage Foundation is always a great place for railfans to stop off at, La Plata had never before had anyone arrived by this luxurious and memorable mode of rail transportation. That was until the trip we helped to organize, in conjunction with Zephyr Route, on the weekend of September 9th, 10th, and 11th, 2016. 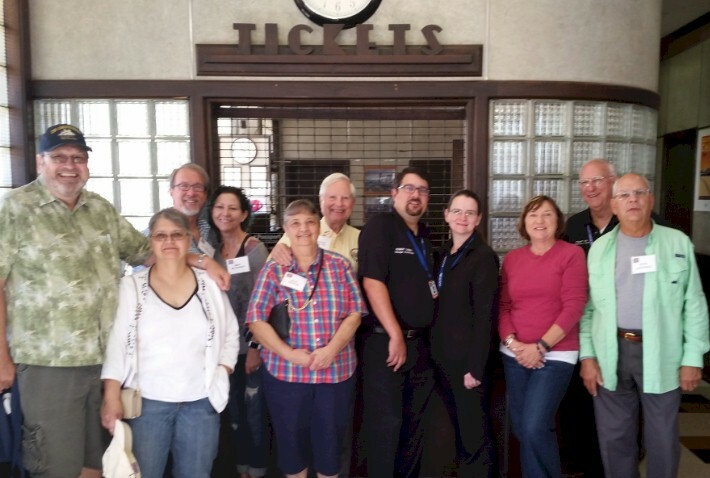 You may recall that between December 2012 and July 2015 the APRHF co-sponsored a Trails & Rails program on Amtrak's Southwest Chief from Chicago Union Station to La Plata, Missouri, along with Amtrak and the National Park Service. 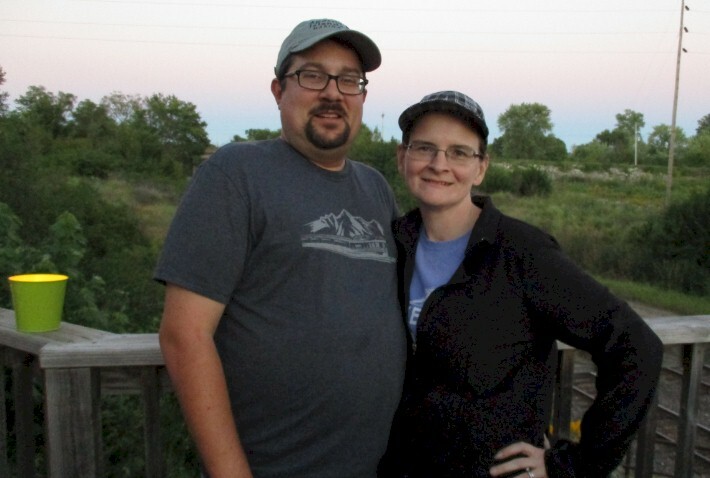 During the three summers that we rode this 298-mile stretch of rail, our Trails & Rails volunteers reached out to more than 50,000 Amtrak passengers, explaining about the people and landscapes seen from the train across Northern Illinois, the "toe" of Iowa, and Northeast Missouri. Our group of 30 dedicated docents were repeatedly recognized by Amtrak and the National Park Service for donating the most volunteer hours of any non-daily Trails & Rails program anywhere in the United States during the 2013 and 2014 summer seasons. Unfortunately, despite the success of the Chicago to La Plata Trails & Rails program, the APRHF Board of Directors was informed by Trails & Rails National Coordinator Jim Miculka that he wished to end the partnership agreement that allowed our program to operate. 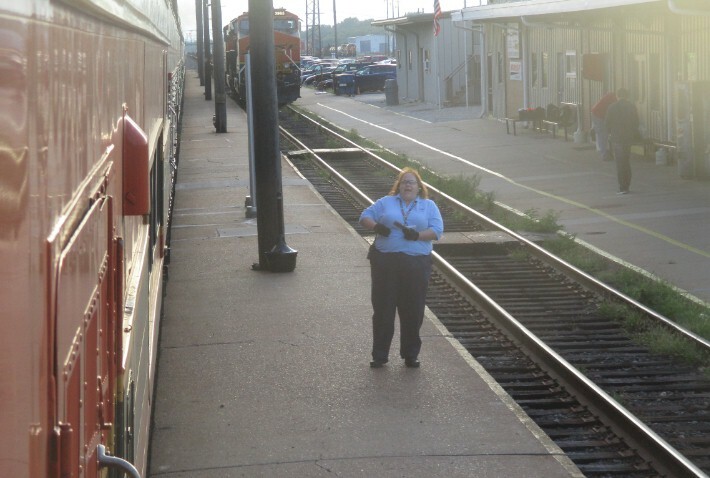 The final Trails & Rails program between Chicago Union Station and La Plata, MO took place on Sunday, July 19, 2015; to date, sadly, there has been no effort to begin a new Trails & Rails program on any long-distance Amtrak train out of Chicago. 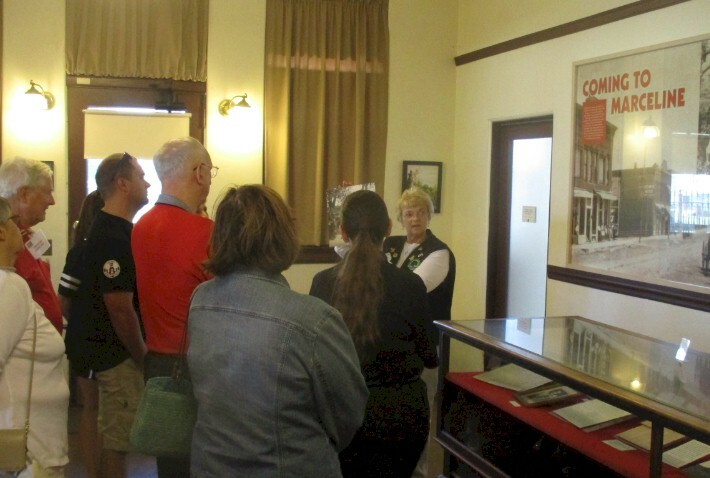 The APRHF invested a great deal of time and funds into developing a unique interpretive program on the Chicago to La Plata, MO route and refused to let the decision of one individual impact our group's mission of educating passengers about what they were seeing out their windows. The day after Trails & Rails ended its operations, APRHF President Bob Cox and former Trails & Rails Chicago Coordinator Robert Tabern announced the creation of the APRHF Rail Rangers program. 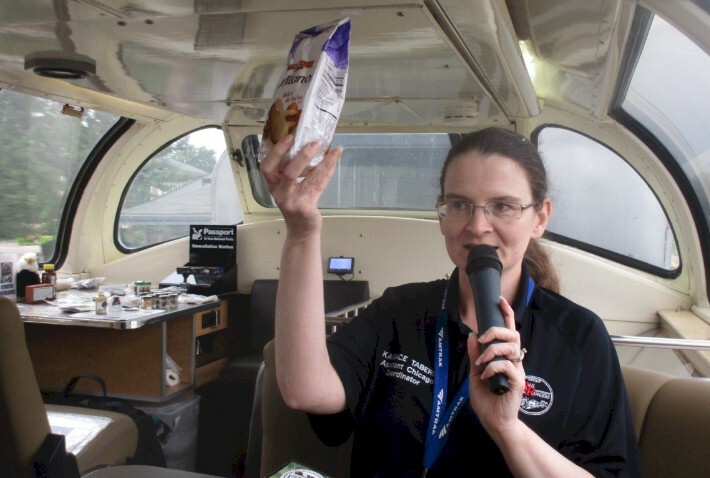 For the past 15 months now, Interpretive Guides with the APRHF Rail Rangers have been presenting interpretive programs aboard private railcar excursions. Trips have taken place to five different states in the Midwest, including Illinois, Iowa, Minnesota, Missouri, and Wisconsin. The APRHF Rail Rangers program currently has five different private railcar partners that organize the trips on which our Interpretive Guides work, including Friends of the 261 (Minneapolis), Zephyr Route (St. Charles, IL), American Rail Excursions (Madison, IL), Friends of the Cumbres and Toltec Scenic Railroad (Albuquerque, NM), and Paxrail (Chicago). APRHF Rail Rangers is also just weeks away from announcing a very exciting new partnership that will have our Guides on a public train once again (stay tuned for that big news!). Our APRHF Rail Rangers Interpretive Guides, who are all former Trails & Rails volunteers, really enjoy telling passengers about the route from Chicago to La Plata, MO via Naperville, Mendota, Princeton, Galesburg, and Fort Madison. In a way, we consider this our "home rails", due to the time and energy everyone put in to creating the interpretive program about this route from scratch back in late 2012 and early 2013. One of our major goals with Rail Rangers, since almost 'Day 1', was to bring a group of passengers to La Plata in a private railcar (and preferibly in a full-length dome car). This is something that had never been done before in the history of the town, we quickly learned from APRHF President Bob Cox and APRHF Vice-President Amy Cox. Planning such a trip ended up being the hardest part of the whole process. No private railcars are currently able to be stored overnight in La Plata due to lack of a quality siding and a switcher engine. This meant that any private railcar round trip journey that would bring travelers to La Plata would have to continue on to at least Kansas City, where the car would be taken off the Southwest Chief and stored for two nights in a secure location. 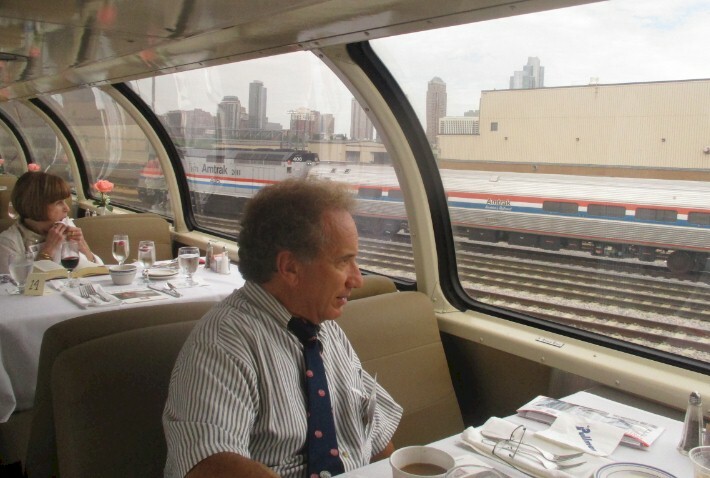 In late 2015, we shopped around the idea of a private railcar trip from Chicago to La Plata to several of our partners. Mike Abernathy, President of Zephyr Route, seemed the most interested. He mentioned that he was already planning a weekend trip to Kansas City for September 9-11, 2016, and agreed to put aside a number of the seats on the dome car for passengers who wanted to get off and on the train in La Plata, Missouri. The deal was set! Heavy promotions about the trip in local newspapers along the way brought in 11 travelers who wanted to head to La Plata; about double that amount bought tickets to ride on to Kansas City for the weekend. 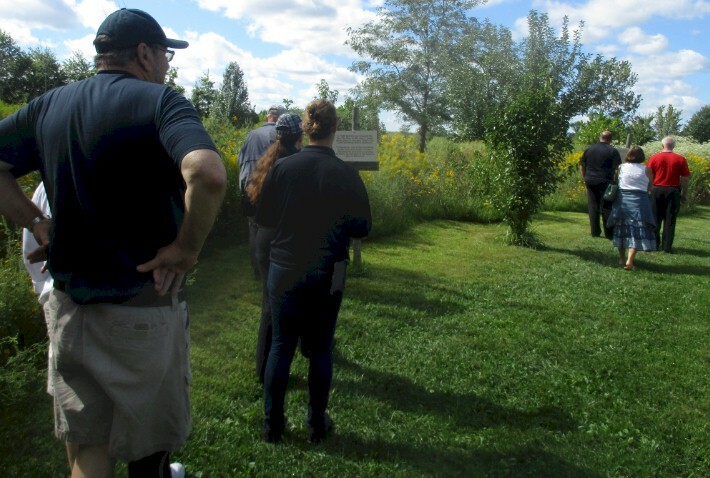 Interpretive Guides for this special trip included some of Rail Rangers' 'top brass', Executive Director Robert Tabern, Chicago Coordinator Kandace Tabern, and Lead Interpreter/Trainer Robert Neil. The group met almost three hours ahead of the scheduled departure time at Chicago Union Station on Friday, September 9, 2016 in order to prepare for the journey ahead. Robert T. got the Rail Rangers Interactive Visitor Center set up with various props about the route and met with Iowa Pacific officials who stopped by to see how things were going. 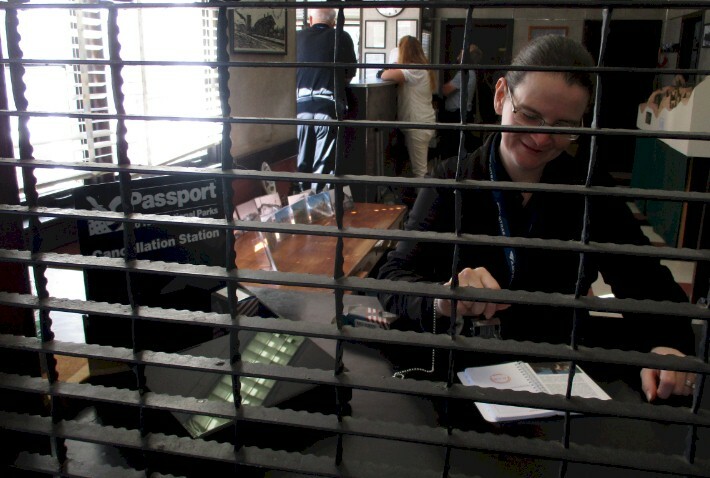 This trip also marked the debut our our new "Passport to Your National Parks" Cancellation Station. Kandace and Robert N. helped greet passengers in the Great Hall and Metropolitan Lounge at Union Station along with Zephyr Route President Mike Abernathy. Around 2:20pm, everyone walked out to the train and found their assigned seats. 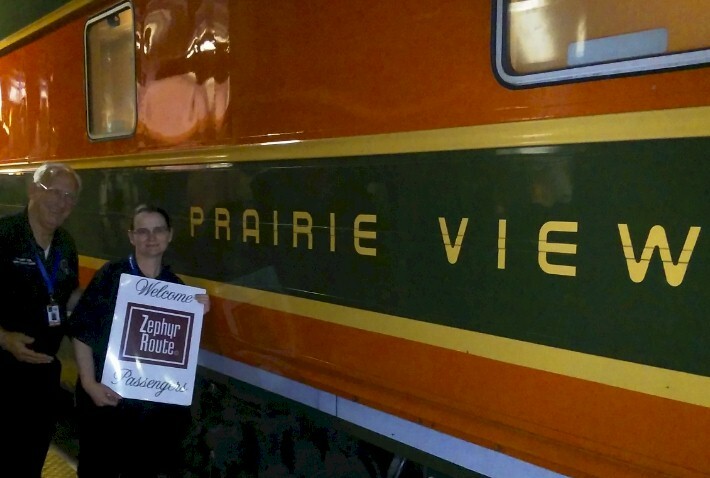 The car that we used for the trip was chartered out from Iowa Pacific Holdings; we are talking about ex-Great Northern Great Dome "Prairie View". For the record, this is the sister dome car to "Ocean View", the last remaining dome car owned by Amtrak. We departed right on time at 3:00pm and quickly scooted along through the western suburbs of Chicago along the BNSF "race track". For those who are not familiar with this term, the BNSF "rack track" is the triple-tracked ex-CB&Q line that runs 37 miles between Downtwon Chicago and Aurora, Illinois. At times, three trains all headed in the same direction, have been known to pass each other! At Naperville, Kandace and Mike headed out on the platform to greet the group of private car passengers who would be boarding there. By 4:00pm, the far western suburbs of Chicago slowly began to fade away, as the farm fields of Central Illinois came into view. APRHF Rail Rangers Interpretive Guides took turns providing narration for passengers, and providing some one-on-one time with each passenger to answer whatever questions they had about the route. One of the favorite stories takes place between Mendota and Princeton, Illinois. Looking off on the left side of the train (when heading west), passengers see a 150 foot high hill in the distance. Our Guides will often ask passengers to use their imagination and guess what the hill might be. Considering the landscape between Chicago and Princeton is about as flat as they come, this hill looks totally out of place. We had some people guess that it was a large Native American burial mound. Other people said it was a garbage dump for the whole county. Someone even thought it might have been the remnants of an ancient volcano! Well, all are good guesses... but the hill is actually a slag pile left behind from the mining operations of Cherry Hill Coal Mine more than a century ago. Slag hills contain non-valuable rock materials taken out of the Earth during a mining operation. Cherry Hill was the site of one of the deadliest mining disasters in United States history! More than 250 men and boys, some as young as nine years old, were killed here in 1909. The coal was used for Milwaukee Road steam trains, so there was definitely a connection between the train line and the passing landscape. One of the props that the Rail Rangers carry with them when talking about the disaster is a mule shoe. It belonged to a mule, who lived in the mine at the time of the fire, but survived. It was donated to the APRHF Rail Rangers program by the Bartoli Family, who currently owns the property. It's special experiences and stories like this that make a private railcar trip so memorable for our passengers. Sure, it may just look like corn and soybeans out there -- but there is so much more when one stops and gets to know the history, people, and places of a region. By 5:30pm, we were rolling through Galesburg, our last station stop in Illinois. Around this time, passengers were treated to a traditional dining car meal that was actually cooked on board the train. No microwaves and no convection ovens! This is something you no longer can experience on an Amtrak train. While they were beginning to eat, Robert N. told passengers about how the famous Marx Brothers got their nicknames while playing poker in Galesburg. Kandace then followed up with a story about the famous Lincoln-Douglas Debates took place in 1860 at Knox College, which can be seen from the train today. A little further west, Robert T. pointed out two alpaca farms which can be seen from the train between Galesburg and Smithshire. 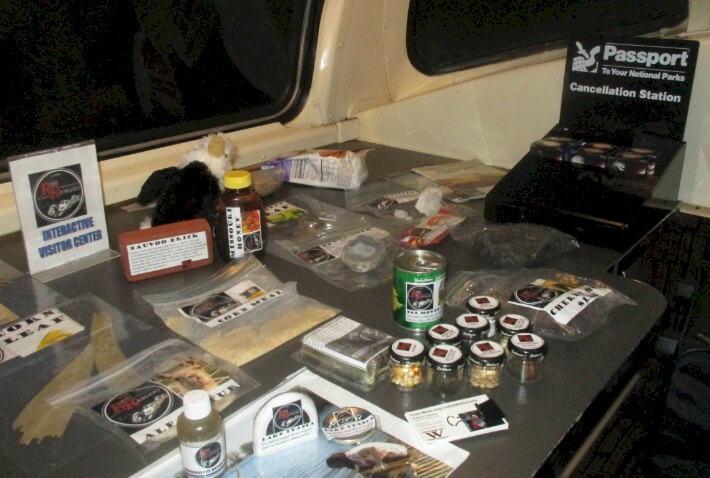 One of the props that he shared with passengers was a bag of alpaca fur that was donated from one of the farms seen from the train. Kandace pointed out Jack and Martha, two alpacas who were just babies (but are now full grown) when we began researching this route under the original Trails & Rails program. 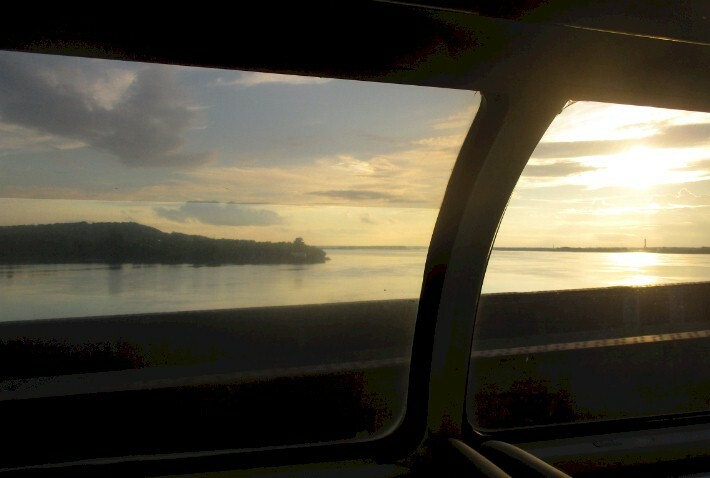 One of the highlights for everyone is crossing the Mississippi River; it is that much more spectacular when you are traveling on a full-length dome car from the 1950's era. And luckily, the train remained more-or-less 'on time' so that the sun was still up for our arrival into Downtown Fort Madison. APRHF Rail Rangers Interpretive Guides ended up pointing out popular landmarks in Fort Madison like the combined railroad-highway bridge, Mississippi River Marina, old pen factory, Fort Madison replica, and the old Santa Fe and CB&Q stations that can be seen from the train. Passengers got a kick out of Kandace and Robert N. walking throughout the train with a jar of Mississippi River water that they had obtained from a 2012 research trip to the area. Robert N. joked about wanting to exchange the muddy water for a glass of a passenger's wine. He had no takers! Robert T. responded by saying the river water looked like Fort Madison tap water! The sun was just setting as we pulled out of the Fort Madison/Shopton depot, but it was still light enough to see the Mormon Temple at Nauvoo, Illinois, about eight miles in the distance across the river, and the nearby wind turbine factory. It was getting dark as we crossed the Des Moines River into Missouri, so we decided to end our narration and spend the last hour talking with passengers one-on-one again. Since the platform is so small in La Plata, our train had to make a triple stop at the station to let everyone off (one stop sleepers, one stop coach, and one stop for all of us in the dome car). All of the passengers were greeted by the warm smiles of APRHF President/Rail Rangers La Plata Coordinator Bob Cox, APRHF Vice-President/Rail Rangers Asst. La Plata Coordinator Amy Cox, and their daughter Karri Cox. Several other curious onlookers were also on hand to see passengers getting off a private railcar for the first time in the city's history. This is another railroad milestone that took place in La Plata now! Bob and Amy provided a brief welcome and orientation of the town for everyone before all of the passengers were taken over to the Depot Inn & Suites, where they would be spending the next two nights. 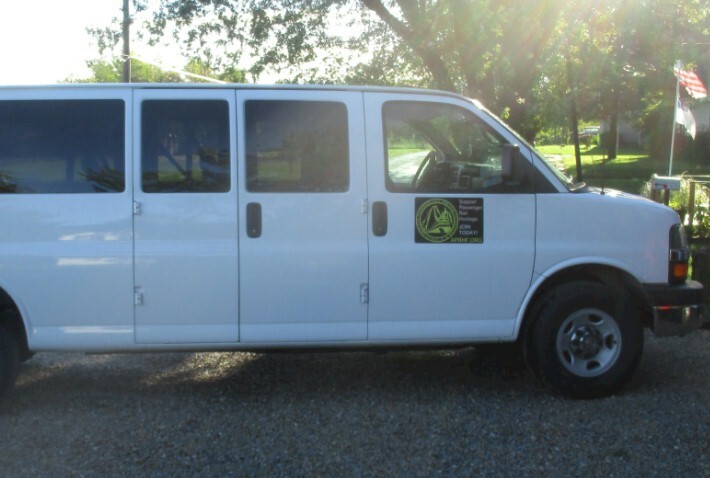 On Saturday, September 10, 2016, passenger participated in an all-day van tour of Northeast Missouri lead by Bob and Amy Cox. The group left the hotel around 8:30am and headed west on Missouri Highway 156, into the heart of Missouri's Amish Country. Stops were made at an Amish bakery where free donuts and coffee greeted everyone. Many of the travelers talked with the family here and purchased cookies, bread, or pies. From there, we headed to an Amish dry good stores where people were able to purchase snacks for the day. 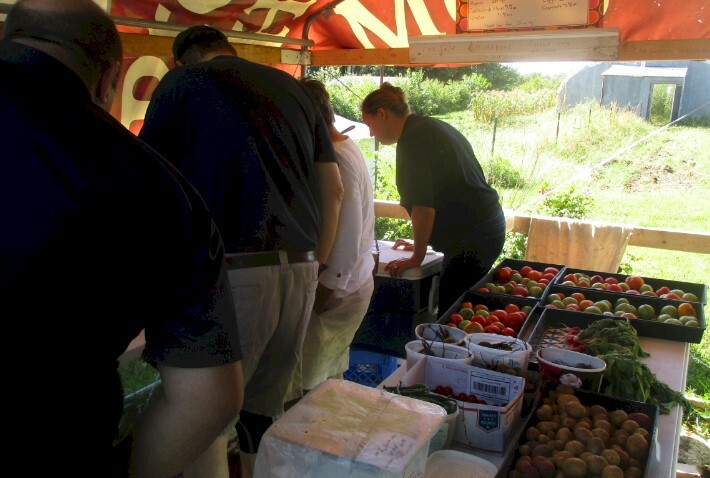 From there, Bob and Amy drove everyone even deeper in the country, hitting several fruit and vegetable stands. One of the highlights was visiting an Amish farm where travelers got to interact with local Amish and get up close and personal with some of their animals. 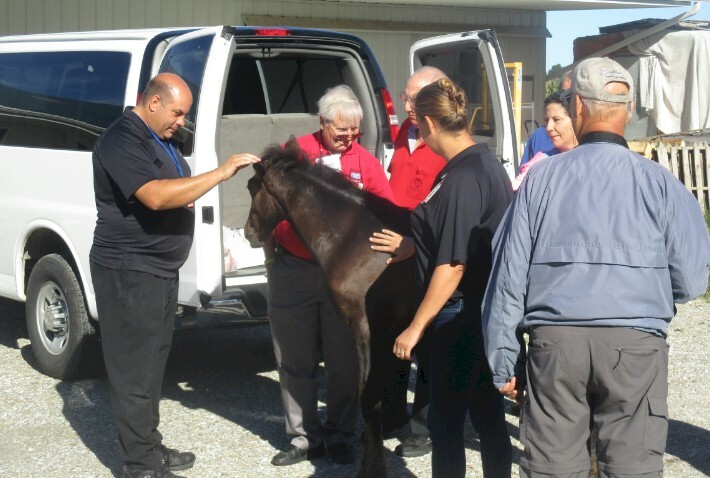 Our favorite was a horse who came up to the van. It was then back to the Depot Inn & Suites for everyone to drop off everything that they bought. Saturday afternoon was spent heading down to Marceline, a town about 45 minutes away from La Plata. 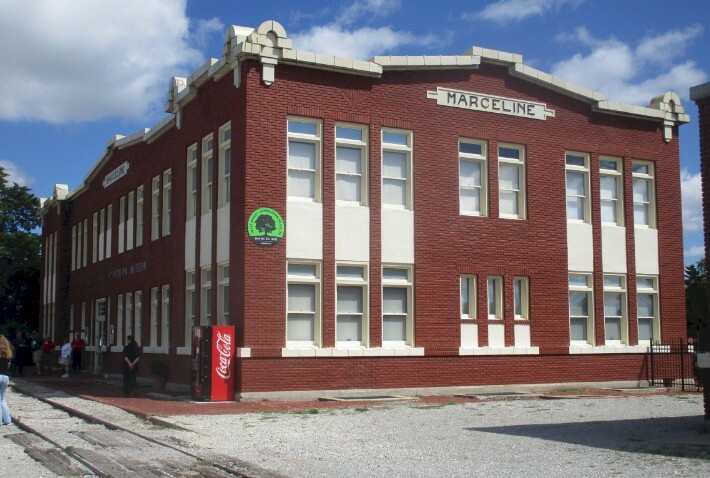 Marceline is best known as the boyhood hometown of Walt Disney. 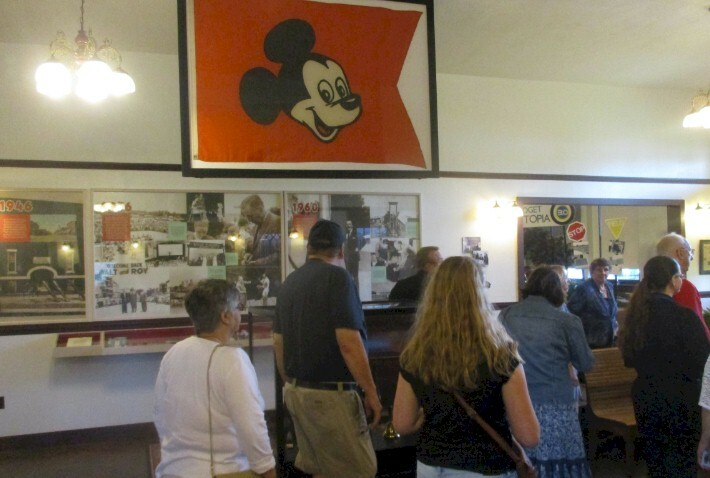 Kay, our tour guide for the museum, had Walt Disney himself stay in her family's home when she was a little girl. She talked about how Walt drew cartoons for her. Kay now owns the former Disney boyhood home, which includes a barn and the remnants of a tree that Walt once sat under and enjoyed the fresh country air. Everyone enjoyed lunch, ice cream, and walking around looking at the old steam engine that was on display in town. Around 4:00pm or so, all of the travelers headed back to La Plata to have some down time at the hotel, and also to check out the APRHF Exhibition of Amtrak history. Saturday evening featured a special BBQ cookout at the APRHF Lookout Point, which was hosted by the Cox and Tabern family. Bob and Amy Cox and other volunteers have recently put in a lot of time and hard work to make significant improvements to the deck and actual Lookout Point building to make it more weather resistant and friendly for visitors. 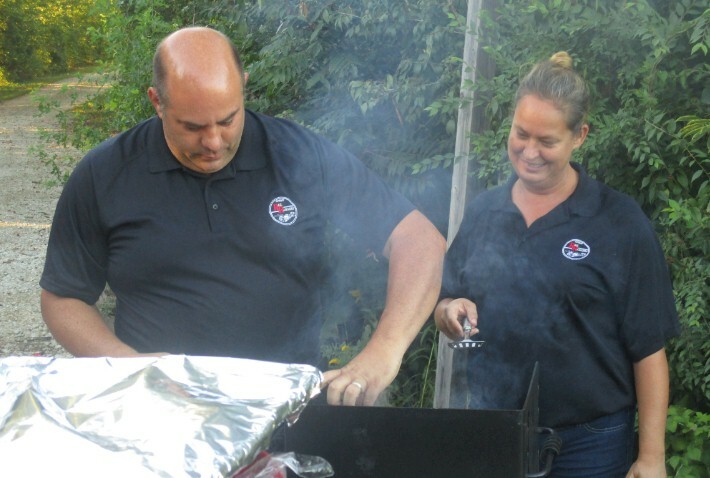 The Coxs and Taberns grilled up some hot dogs and freshly made hamburgers for everyone. 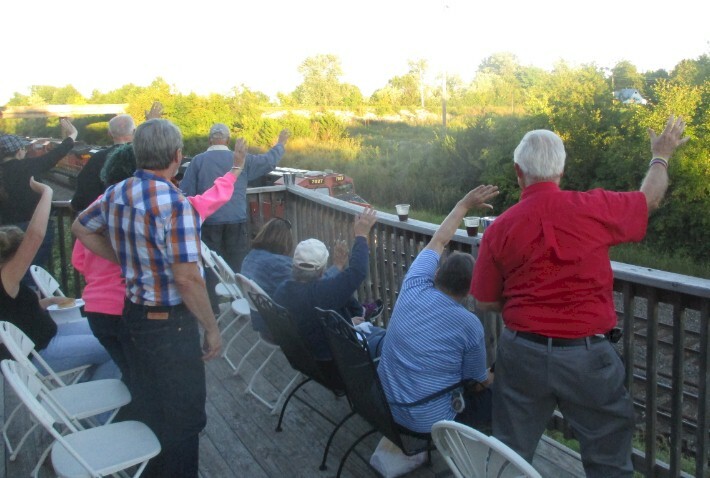 Visitors loved the chance to enjoy a small town cookout while watching various freight trains pass by on the BNSF mainline. 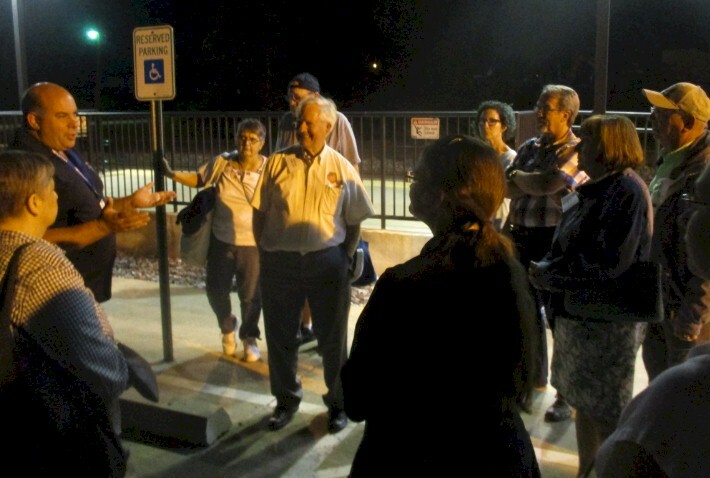 Things culminated with the arrival of the westbound Southwest Chief through La Plata around 8:00pm. After a day that went way too fast, it was time to head back to the Windy City for everyone! Due to a two hour late eastbound train, passengers had some extra time to sleep in and enjoy the Depot Inn & Suites on the morning of Sunday, September 11th, 2016. 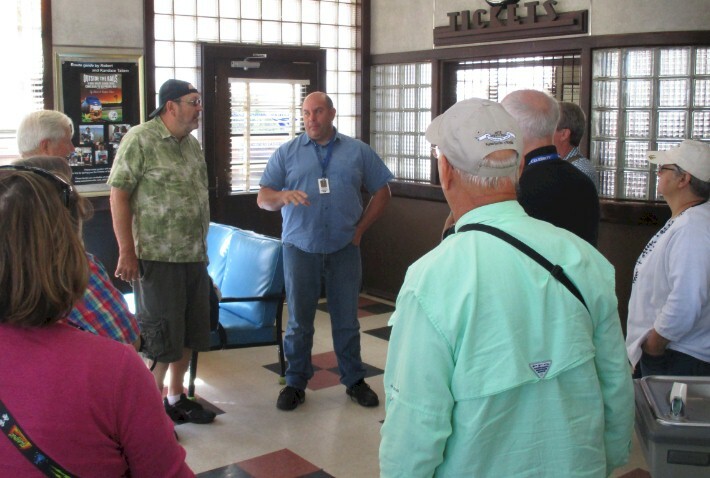 Around 10:30am everyone headed over to the Amtrak station for an exclusive behind-the-scenes tour with Bob and Amy Cox, who are also the main caretakers for the historic station. The train arrived around Noon, and all 11 passengers loaded back on "Prairie View" to join the Kansas City passengers who started out on the train trip about two hours earlier. From there, it was back on the road again for the 298-mile return to Chicago. Passengers were treated to a tasty lunch and snacks provided by the crew. The day wrapped up with the arrival of the dome car into Union Station around 5:30pm. Did this trip sound like fun to you? Well, we hope so! As we mentioned, APRHF Rail Rangers partners with five (soon to be six!) different private railcar operators who plan fun and exciting trips like this all over the Midwest. While most of the trips for 2016 are "in the books" already, work is already underway to plan out our 2017 trips. Rail Rangers is hoping to team up with Zephyr Route again to do a repeat trip to La Plata and the Kansas City area, possibly in mid-August 2017. Other trips that Rail Rangers have been involved in during 2016 included Springfield, Saint Louis, Galesburg, Quincy, Hannibal, Milwaukee, Minneapolis-St. Paul, and Milwaukee. The best way to get notified about future trips is to "like" our Facebook page and to send your e-mail address to railrangers@rtabern.com so that you can get added to our new E-newsletter list. There is no advertising or spam involved.. just a monthly (or so) e-mail update on private car trips that are coming your way. Do you have a great idea for a private railcar trip? Then, be in touch with APRHF Rail Rangers in the next month or so and we'll bring it up when we sit down with our private railcar partners over the winter to plan out our 2017 dates and destinations. We would like to thank everyone who has been supportive of our group over the past 15 months and made our efforts such a success, especially our private railcar partners who took a chance on having our Interpretive Guides on their train.